This whole "suing the town" thing has been very stressful and taken quite a toll on me. My late mother taught me how to knit. She was a nurse practitioner and swore that knitting released serotonin. I believe that. Knitting this hat for my nephew has been incredibly therapeutic. I started on Sunday afternoon and have been knitting up a storm on my 50+ minute train ride in to the city. I must look a bit curious knitting in a suit, but I've not been taunted once--yet. Knitting: It's Like Riding A Bike; you never forget how to do it. Do you guys remember that time I went to the Yorktown Zoning Board of Appeals meeting and ended up correcting the "special" counsel to the ZBA on the ins-n-outs of uses permitted only by special permit in an R1-10 zoning district? Take note at 1 minute, 24 seconds into this video. Please note whom the zoning board chairman, Mr. Gregg Bucci, asks what section of the code special use permits are outlined in [answer: section 300-30] when he gets frustrated with the facts I am presenting him; that would be Mr. Capellini. This, immediately after I told Mr. Bucci he was wrong and both he and the special counselor emphatically told me I had no idea what I was talking about. I was the only one in the room with the current code. Mr. Capellini knows what I'm talking about, right Al? Considering the actual zoning chairman, Mr. Gordon Fine, cohabitates the same office with Mr. Capellini, it certainly raises an eyebrow. Also how Mr. Bucci refers to Mr. Capellini as "Al" and when he isn't sure he asks him for guidance shows how comfortable their relationship is. Of note: Messieurs Capellini, Fine and Bucci are all attorneys. Global conspiracy? Doubtful. Makes you wonder? Sure does. The applicant is only providing 63 standard parking spaces. Per code (4 people per space x 63 = 252 people). The town allows some "stacking" [read: double/triple/quadruple parking within the proposed three parking lots] and the applicant claims they will provide 86 total spaces. The applicant proposes 344 people to occupy the second floor; the also put forth the absurd proposition that the entire first floor will never be occupied if the 2nd floor is occupied. Not only is that completely un-enforcable (the town won't enforce the code on the two homes the church illegally converted to suit their needs), but there is no code citation they can make to justify such a crazy deviation from established zoning law. 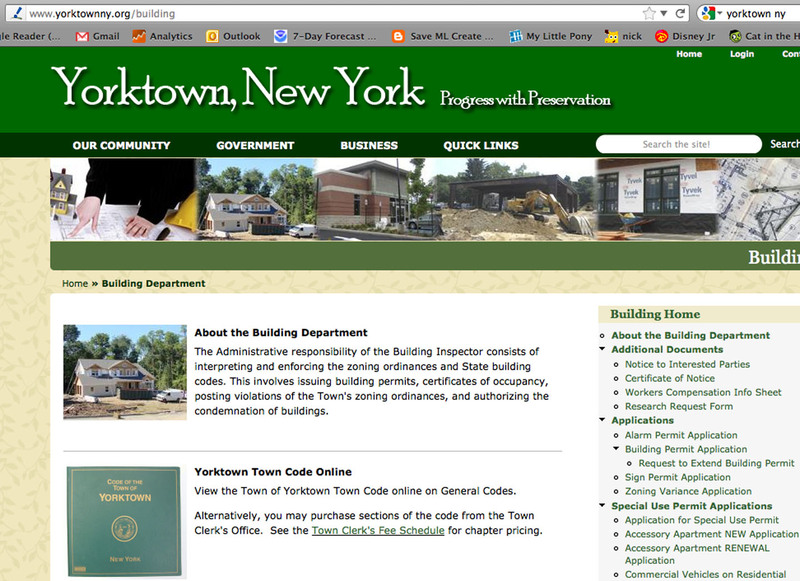 By all accounts, Site Design Consultants of Yorktown is a reputable engineering firm. Their professional engineers represent many of the high profile developers in Yorktown. 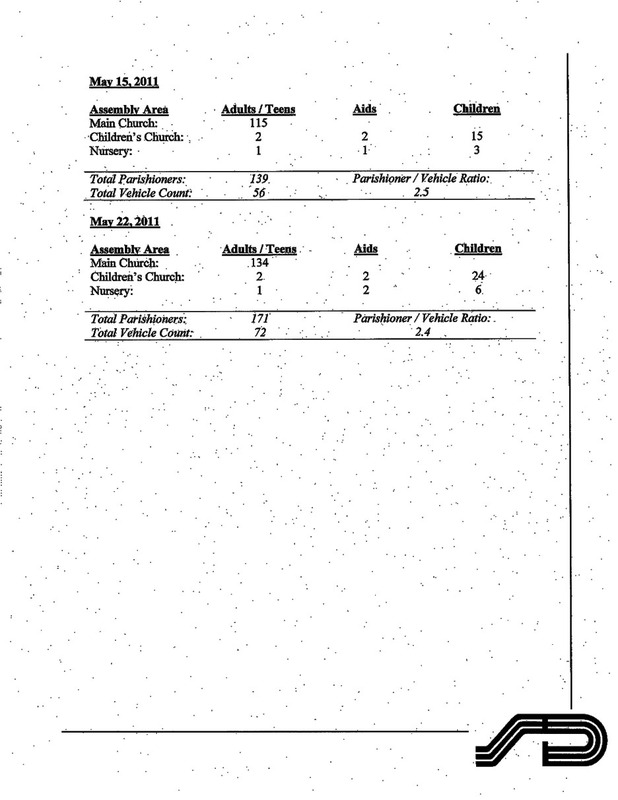 Last year they did a six (6) week parking study of Faith Bible Church (images above and below) which was submitted to the zoning board attached to a sworn affidavit from pastor Zotolli. What they found is that the special use the applicant is proposing can not provide the minimum code requirement (a ratio of 4 people to 1 parking space). The best ratio the applicant provided during the study was 2.7 people per parking space; it fluctuated between 2.3 to 2.7 people per parking space. At 2.7 people per parking space (what they can actually provide on their best day) only supports an occupant load of 170 people (63 spaces x 2.7 people per space). Conveniently, that's the occupant load they have already illegally increased to. That would seem to be the biggest church that could be supported by the parking limitations, if you are a fan of the truth. 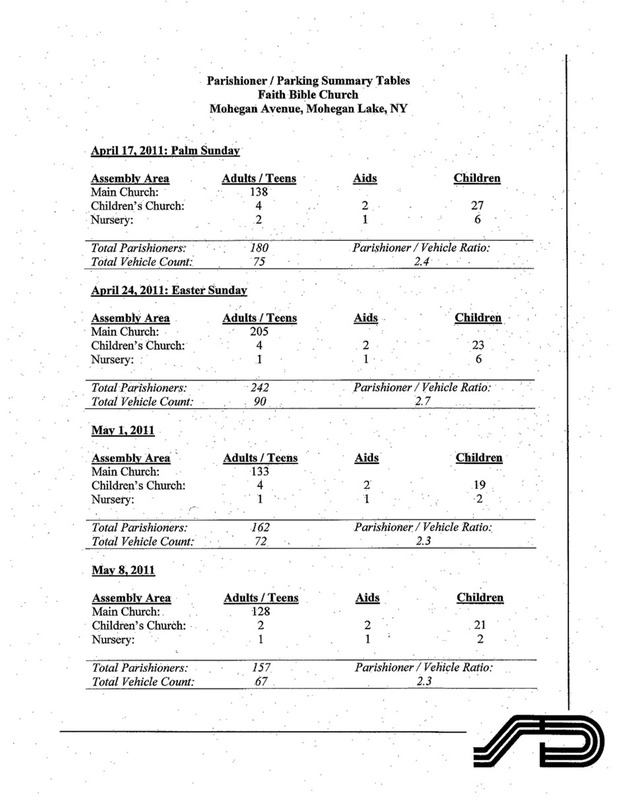 Please note that the town only approved 100 occupants to be at this church "3 days a year, for 3 hours." Considering how the church actually occupis the site, they are not only a danger to themselves (the town has no idea if 242 people can safely egress from the sanctuary), but to the small residential home owners associations that surround the church. I pray nothing happens as the result of lax enforcement on the part of Yorktown! I'm completely setting aside the fact--the cold hard fact--that the church has terms and conditions on the wetland parking lot that allows Shrub Oak Lake Estates (a neighboring home owners association) member the right to park "at all times" and "at no cost." In fact the church is in violation of the terms and conditions of their deed by not posting that it is private parking for SOLE and FBC members. All these inconvenient facts. No one is saying the church can't be expanded, just that it has to be in keeping with the character of the neighborhood and have sufficient parking. Yorktown is turning a blind eye to the fact that the church already expanded without any permits or approvals. Now the church is claiming hardship. The houses they illegally converted don't accommodate the growing congregation; ha! If you ever decide to illegally convert your house to a use requiring a "special permit," you should shouldn't hesitate. Do whatever you want without permits or approvals because Yorktown is either unwilling or unable to stop you, as evidenced by the blind eye they turn to the applicants illegal conversions. It should be noted that the applicant only recently (circa 2005, when they acquired title) illegally converted the red house on Sagamore Trail. Up until that act, it had been occupied (legally) as a single family home. Have You Picked Up the Westchester Guardian This Week? 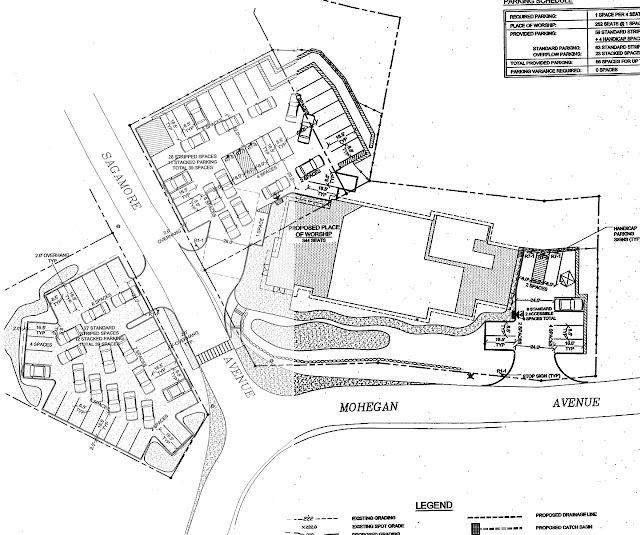 The Yonkers Tribune has an interesting article about my neighbor's proposed development. You can read it here. It's official. I confirmed it with the Westchester County Sheriff's office. Phew, at least I won't get thrown out for a defective service. It's related to the issue I've dedicated this site to, but is a bit more general. I'll be accepting zoning and code questions from readers and answering them weekly with my best, professional guess. I do have an architecture degree from The Cooper Union For The Advancement of Science and Art and have practiced as a building code and zoning consultant in Manhattan for over 10 years, so I know a thing or two about the issues. I hope you can follow along. Here's a link to my first post. As expected, Faith Bible Church's application will be in a working session with the Yorktown Planning Board on Monday, January 23rd. Don't bother turning out because they won't let you speak; do feel free to write the planning board with your concerns though. As soon as the application goes (sails?) through the Planning Board, they have permits, so it's crunch time. Stay tuned. Wow. So, I formally filed my first lawsuit today. It's against the Town of Yorktown Zoning Board of Appeals and it challenges 3 of the 4 variances the ZBA approved for Faith Bible Church. I still have to serve the board; well, technically, because I'm party to the proceeding, I can't do it myself. It looks like I'm going to have to have my wife do it as she's the only other one in the house over 18 not party to the action (I'm accepting volunteers in the comment section, below). Once the zoning board of appeals has been formally served, I'll put the whole thing up on this website; it wouldn't be fair to give them a head-start, right? In other news, I wanted to mention that I have accepted an offer to opine on this subject for a local website. More on that very soon. 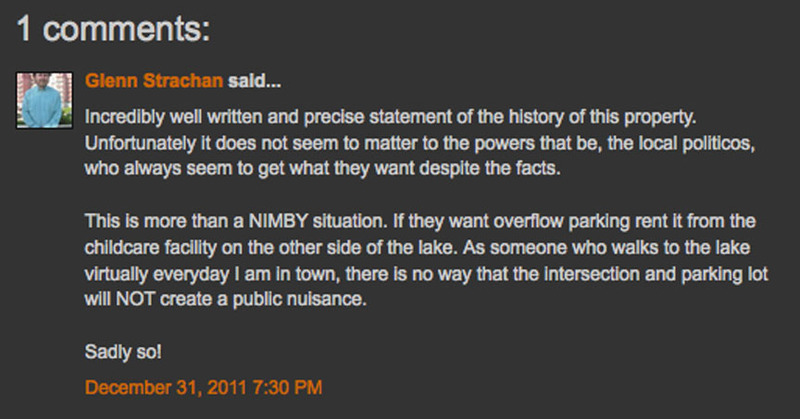 Above: A reader's comment on Jack Kahn's letter to the ZBA. The new year brings us many new and exciting opportunities to present our concerns with the proposed new development heard with the town. It's important that we leave both verbal and written comments on the public record regarding all of the concerns we have; from parking to environmental; from the quality of life considerations to the detrimental impact on the character of the neighborhood and its unique steep slopes. Did I mention parking concerns? Mr. Strachan brings up some interesting points. Additionally, it is important to note that Shrub Oak Lake Estates (SOLE) still retains ownership of the wetland parking area via permanent easement recorded in the deed conveyed to Faith Bible Church. I'm to lazy to expound on it in this post, but it's true. 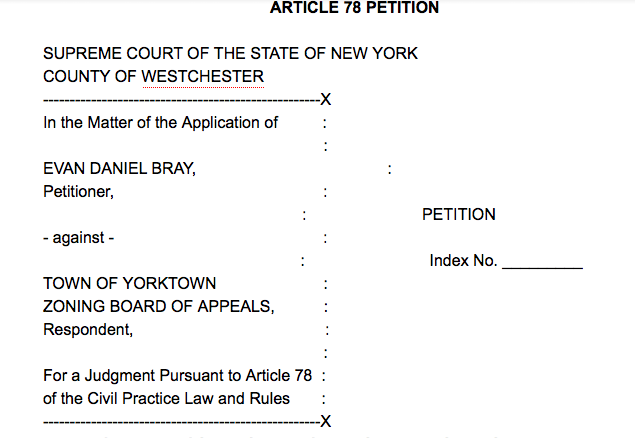 The deadline for filing an article 78 petition challenging the Yorktown Zoning Board of Appeals' decision approval of the zoning variances are fast approaching. If legal action is taken, the required documents will most likely be filed this week.